I’m buoyed up by the fact that every few years a Westerner, somewhere in the world, expresses interest in Japanese historic temple braids. A spurt of such interest this week has pushed me to update a previous post from June 2009, as follows. Left: top and bottom faces of the square braid. Right: side faces. What’s an historic temple braid doing in such a small town, a long way from anywhere? An historic temple braid has been found at Chusonji Temple (alternatively spelling Chuzonji) in the town of Hiraizumi, north Honshu. Hiraizumi was the second-largest city after Kyoto in the twelfth century; nowadays it’s a quiet town with only around 8,000 inhabitants. That this now small town (2hours north of Tokyo by shinkansen bullet train) is a centre of extant 11th century Japanese culture, with 3,000 national treasures, explain why a temple braid of immense complexity finds itself here. While not affected by the March 2011 earthquake/tsunami despite being in the Tohoku region (modern day Iwate Prefecture), Chusonji Temple was happily named the 12th significant site by UNESCO on June 25, 2011. This recognition is hoped will spur on local tourism and recovery from the natural disasters. The square braid was recovered from the tomb of Lord Hidehira, part of the Konjiki-do, a golden temple on the Buddhist temple site. This Konjiki-do, built by the Fujiwara’s is decorated inside and out with lacquer containing gold foil and studded with gold and silver, a symbol of the gold culture of Hiraizumi. Historical artefacts and Buddhist statues found in the Konjiki-do are now stored in the Sanko-zo storehouse and on public display. A slim volume published in 2003 sets out the historical context and explains kumihimo braiding. 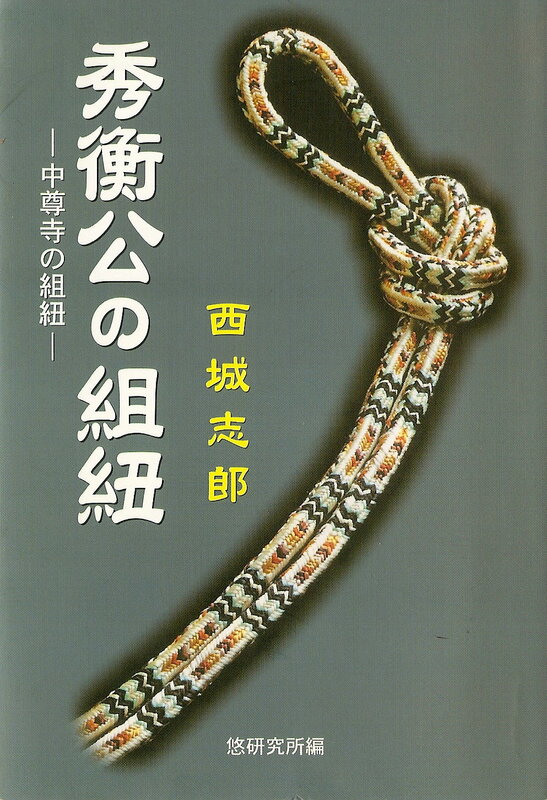 The other major academic tome on the braid itself is Kinoshita’s “Archaic Braids”. Both books are in Japanese. A square braid made on a two-level takadai with 72 bobbins; the structure is a natural extension (simply more bobbins!) of Saidaiji-gumi, the historic temple braid from Saidaiji Temple. Done here in embroidery cotton; 100gm bobbins; total length 40cm, 8mm wide – 17 ‘lozenges’. This is technically-speaking a half- or han-chuzonji-gumi because the full version requires 144 bobbins. Mistakes tend not to be noticed in the front side, facing the braider, but become visible on the side face. Yes, it took me ages to braid (probably a centimetre every two or three hours) and yes, I hope to re-do it ‘properly’ one day… full-standard obijime length, in silk. I suspect the braid would be much more flexible if done on a marudai, compared to a takadai loom. I’m guessing from the photos in Shirou’s book of the six extant fragments of the original braid that a fugitive red/orange/yellow dye from the benibana (safflower) plant was used: the colour has run and the entire middle section of each design segment is largely pink as a result. In the West, we’d probably not have direct access to benibana; in any case, a dye less likely to run would be favoured. What has stayed intact in the original braid are the dark brown (either kakishibu, fermented persimmon juice, or some other dyestuff heavy in iron oxide) and the dark blue (undoubtedly indigo). The dark blue almost certainly arises from fibre dipped many (dozens) of times in the indigo dyepot.